Did You Catch My Latest Tutorial? 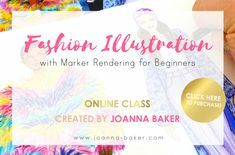 This entry was posted in Inside the Studio and tagged artist, basic fashion poses, drawing video, fashion how to, fashion illustration, fashion illustration tutorial, fashion illustrator, fashion sketch, fashion video, how to, how to draw, illustrator, joanna baker, learn to draw, pencil sketch, rough draft on June 19, 2018 by Joanna Baker. This entry was posted in From the Sketchpad and tagged artist, beach, bikini, blackberries, calendar, fashion, fashion illustration, fashion sketch, favorite things, favorite things 2017 calendar, fourth of july, happy 4th, illustration, joanna baker, july, july 4th, new month, shells, summer, summertime, swimsuit on July 1, 2017 by Joanna Baker.